For the 20th time in 58 years, the Beanpot championship will come down to Hockey East rivals Boston College and Boston University. The Eagles dominated Harvard in a 6-0 win and the Terriers won a 2-1 nail-biter against Northeastern in the first round of the annual tournament pitting all four of Boston's Division I hockey programs for the first two Mondays of February each year. Boston College used a 33-save performance from junior goaltender John Muse to shut out the Crimson and give the Eagles their first Beanpot shutout since 2002 and their ninth consecutive win against the Crimson in the tournament. 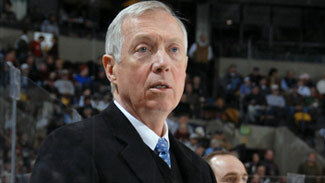 "We had a lot of balanced scoring tonight, which is crucial," Boston College coach Jerry York said. "Your first line isn't always going to be the one that scores. We are quick as a group of players, but you're only as quick as the puck moves. One thing we really stress is puck movement, and I think we moved the puck really well." Meanwhile Boston University earned its 15 th Beanpot finals berth in the last 16 years and 42 nd in the last 48 years. Quebec native Alex Chiasson scored with 5:47 remaining in regulation to break a 1-1 tie. Sophomore Kieran Millan made 26 saves in the win and now the Eagles and Terriers will add another chapter to their rivalry next Monday at TD Garden in Boston. In April 2008, Michigan freshman goaltender Bryan Hogan, who had played in only six games during the 2007-08 season, suddenly found himself in the Frozen Four semifinal against Notre Dame. Why? Starting goalie Billy Sauer, who had been the star for Michigan that season, going 30-4-3 with a 1.89 GAA, had surrendered three first-period goals and coach Red Berenson felt a change was needed. Hogan was sensational, stopping 18 of the 19 shots as Michigan mounted an amazing comeback to force overtime. But 5:17 into overtime, Hogan was finally beaten, and the Wolverines' valiant comeback fell short. "He came in, he's a freshman, he's played what four or five games?" then senior Chad Kolarik said. "He did a heck of a job. I just thanked him. He gave us seniors a chance. That's all you can ask from your goalie." After taking the starter's role from Sauer last season and posting a 24-6-0 record (1.97 GAA; .914 save percentage), Hogan is trying to save the Wolverines again. This time, Michigan is trying to avoid becoming the team that broke the Michigan hockey program's streak of NCAA tournament appearances that currently stands at 19. The Wolverines have had an up-and-down season and are 15-12-1 (10-9-1-0 in the CCHA) heading into Thursday night's game with conference rival Bowling Green. Michigan has been streaky, losing five in a row from Nov. 6-20 and then winning four straight Dec. 30-Jan. 15. Hogan (15-11-1 with a 2.27 GAA and .902 save percentage) believes his team is ready to start another winning streak. They surely don't want to be known as "that team" and end the tournament streak for Michigan. "I think the win at Michigan State to get a split helped a lot and our confidence is higher lately," Hogan said. "Yeah, of course you don't want to be remembered as that team that broke the streak but you can't let that distract you or hang over you because then you will probably become that team and you just need to prepare for each game and focus. "If you start letting your mind wander and think about negative stuff like that, you're in trouble. We did talk about it earlier in the season and about having pride in playing for Michigan and being part of the program, but at the same time we need to just go out and do it and I think we've been playing better." For now, it is about focusing on the present. There are nine games left in the regular season and then the CCHA tournament. Chances are that in order to make the NCAA tournament, Michigan needs to run the table or come as close as possible to doing so and then either win the CCHA tournament or at least make a run. But Hogan and the Wolverines aren't looking down the road for now; instead they're focused on Bowling Green Thursday and then an outdoor game at Wisconsin Saturday. The University of Wisconsin will play host to the Culver's Camp Randall Hockey Classic on Feb. 6, 2010 at Camp Randall Stadium. The UW women's hockey program will take on the Bemidji State Beavers at 2 p.m. (CT) outdoors at the stadium as part of their weekend series, while the men's program will follow against the Michigan Wolverines at 5 p.m. (CT) in what will serve as the United States Hockey Hall of Fame Museum Game. Camp Randall Stadium holds 80,321 fans for football games. "The University of Wisconsin has one of the most famous football stadiums in college athletics and one of the most storied men's and women's hockey programs, as well," said Wisconsin Director of Athletics Barry Alvarez. "That makes a perfect match for this kind of event and so we are delighted to be able to bring outdoor hockey to Madison." "You have to focus on each game right now and not worry about the bigger picture," Hogan said. "You obviously have goals and keep that in the back of your mind but you can't let it weigh on you. You're working toward those goals but it's important to take one step at a time get where we want to be." In terms of his individual situation, Hogan is right where he always wanted to be and he credits the coaching staff and that loss to Notre Dame in the Frozen Four for helping him get to this point. There were questions prior to that moment that Hogan may had been looking into transferring and heading to a school where he could be the No.1 goalie, but Hogan claimed he never had any doubts about staying and doing just that at Ann Arbor. "I knew I was going to come back and never really had that intention of leaving," he said. "But yeah, that game definitely gave me more confidence and made me know I can succeed at this level, being a No. 1 goalie for a program like Michigan. Obviously I wish we had a different outcome, but that was a pressure situation and I thought I played well. It has really helped me after that and made me stronger." Hogan always knew that playing for Berenson and his staff was the path to success for him and he's appreciative of all they've done to help him become the goalie he is today. "I've seen what happens to other players when they leave early or transfer and sure some of them have instant success or chances in the NHL or maybe another school but really the majority don't and I'd rather be playing more here and getting my education," he said. "This is such a good program and you can learn so much from a guy like Red and it's just been a great experience. He's just one of those guys who really knows how to handle any situation and any player. He's straight with you and he tells you what he feels. He doesn't pull any punches. He's honest and that's helped in an up and down season like this. He's done a great job guiding us through this. Josh Blackburn, our goaltender coach, has been amazing as well. He has really helped me with things like rebounds and the little things you need to work on every day." That's exactly the approach Hogan and his teammates are taking now as they embark on the stretch run, keeping it simple and focusing on the little things. "We need to keep that mentality of simplifying going and not even say game-by-game but even period-by-period," he said. "I really think this team is a good team and we can do something here, so we need to keep pressing." On Campus Clips -- Notre Dame associate coach Andy Slaggert has been named the recipient of the Terry Flanagan Award, presented to an assistant coach for his career body of work. Slaggert is in his 17th season with the Fighting Irish and has served under three head coaches -- Ric Schafer, Dave Poulin and Jeff Jackson . The award is presented by the American Hockey Coaches Association. ... National scoring co-leader James Marcou of Massachusetts, Massachusetts-Lowell senior Kory Falite and Yale senior Sean Backman are among the nominees for the Walter Brown Award for the second straight year. The award is presented to the best American-born college hockey player in New England. Sixteen players are on the list released by the Gridiron Club of Greater Boston on Monday. Marcou, a junior who has 40 points in 26 games, is a nominee for the third time. Here's a complete list of the nominees: ... Confirming a long-held rumor, Michigan Thursday announced that it will host Michigan State outdoors at Michigan Stadium on Dec. 11, 2010. Faceoff for the game, dubbed "The Big Chill at the Big House," is scheduled for 3 p.m. ET. The teams set the international attendance record for a hockey game by drawing 74,544 to Spartan Stadium in East Lansing, Mich., on Oct. 6, 2001. Michigan Stadium holds 106,201 for football. It will be the second-straight season with an outdoor game for Michigan. The Wolverines are playing at Wisconsin's Camp Randall Stadium on Feb. 6.